Simpsons characters rarely change their outfits, but when they do, they create decade-defining trends that reverberate through the zeitgeist, influencing the runway for years to come. Noticed a lot of pale pink with black trim these past few seasons? True fashionistas know this is inspired by Marge’s discount Chanel suit—the one that impresses her high school friend and gains her an invite to the Springfield Country Club. Muumuus? Everyone knows Homer made them big again in 1995. 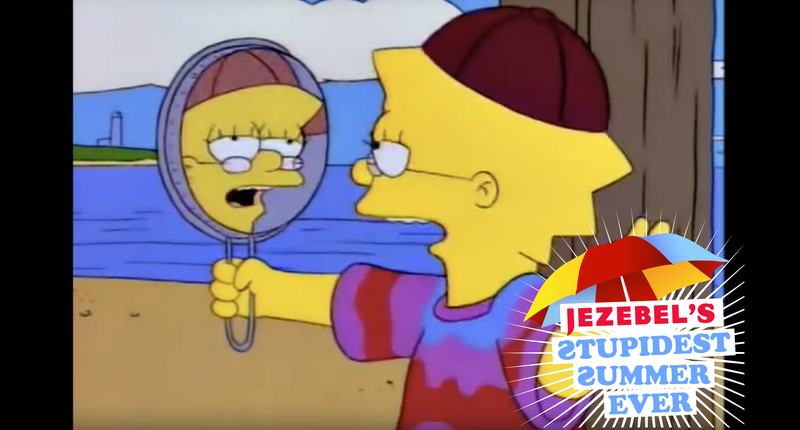 Countless summers (or 22, to be exact) have been shaped by the looks Lisa served in “Summer of 4 Ft. 2,” the final episode of The Simpsons’ seventh season. Let’s set the scene: The summer of ’96. After realizing how unpopular she was on the last day of the school, Lisa decided to change up her usual orange-strapless-dress-and-pearls ensemble for the summer, “forgetting” to pack for their vacation so that Marge would take her shopping. The look she put together got her cool new summer friends, and became an instant classic, the inspiration for many tattoos—and now, clearly, for your 2018 summer wardrobe. Like Cool Lisa’s catchphrase—like, y’know, whatever—it’s a look that says “effortless” while actually involving some serious effort. First, you’ll need a red, blue, and purple tie-dyed shirt. You can make one, or you can find one on Etsy. Next, jorts. You can’t normally buy shorts with a hem this jagged, so you’ll have to cut up some existing jeans or shorts—and nothing says “like, y’know, whatever” like intentionally cutting your shorts into zigzags. Find yourself a baseball cap in... leather? Burgundy denim? I don’t know. Wear it sideways. Top it all off with some vintage pink micro sunglasses. But don’t forget the most important element. No Cool Lisa ensemble is complete without an attitude shift to go along with it—a dumbing down of your sentences and a betrayal of your true self in order to find the confidence to approach and befriend people, at least until the point you realize that your new friends actually like you for you, but you still never see them again! Like, you know, whatever!